A blog to share the stitching, crocheting and crafting creations made by a hermit -like creature called Sarah! I reside at the most Easterly point of England with my husband and two daughters and our cat. They are all incredibly supportive even if the crafting does take over the house from time to time. 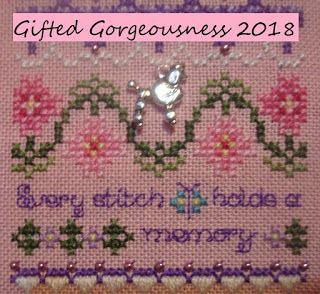 My favourite is cross-stitching which is closely followed by crochet although crocheting is a relatively new pastime! Today is a new moon, that means it is time to share the 'Totally Useless Stitch A Long' or Tusal for short! 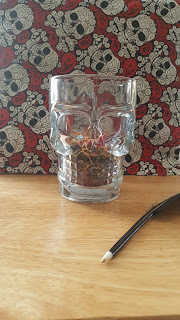 My ORT jar happens to be a novelty skull shaped drinking glass and I'm hoping to end up with a very colourful creation. If you would like to join in with this Tusal you can find all the details here or click on the Tusal image on the right-hand side of the screen. Love your ort container and the fabric behind it. We have several of those cups. Makes a great ORT container. Love the ORT container. You could fill one up just with glow-in-the-dark ORTS! The beginning of a new journey!